Early this morning we and our friend Alex C. Schaefer launched a new project of special interest to iOS and Mac developers. WWDC Blast is a free service to inform you via SMS the very moment that WWDC tickets go on sale. With tickets having sold out last year in under two hours, there’s no better time to automate this. We won’t spam you, we won’t sell your information, we just like the idea of keeping people as informed as possible. Check it out. Technically, this project was a fun one. It’s the first web app we’ve launched, and while the guts aren’t incredibly complicated, we’re integrating lots of cool services and frameworks to make some magic happen. We’re using Heroku, Twilio, S3, Twitter Bootstrap, MixPanel, and some other cool stuff that isn’t even user-visible yet. And the list goes on. Most fun of all is that we put together the whole thing, soup to nuts, concept to launch, in under four days. That’s right: the initial idea was broached Monday morning. We launched early early Friday. Another year-and-a-bit, another successful client project! As of a few weeks ago, Polk Street Press shipped a brand-new storybook, Spatter and Spark. It’s a genuinely endearing tale of two best friends solving problems together in a way that five-year-olds will find endlessly entertaining. We do too. The story is engaging, the character design and illustration is phenomenal, and there’s just a ton of incidental interactivity to keep the experience fresh and engaging read after read. There are also IAP games and activities designed to teach a preschool skill set – they happen to be pretty fun, too. In a very cool innovation, the activities, and some in-story data, are optionally parsed on PSP’s backend to give parents an auto-updating report on their child’s educational progress. Most importantly from the perspective of this blog, Spaceman Labs is responsible for all the code in the iOS app. We built on all the work we’d done for Goodnight Safari, and were able to make use of a lot of clever stuff we’d done, like cancelable blocks, audio-synced text highlighting, and animated character encapsulation. But we also developed the animation framework significantly. As it’s now Polk Street Press’s IP we can’t tell you too much about it, but we can say it delivers greatly improved fidelity, performance, and memory utilization (yes, more than just fixing leaks), all of which enables much more detailed, expressive, and long-running animations in the same app size and on the same hardware. We also did a lot of work on moving animation specifications out of code and into artist-maintainable XML, which allowed for rapid iteration without our involvement. We’re really proud of this project. We love the work we’ve done, and we love the finished product. So far reviews on iTunes seem to agree. Check it out (on the App Store and at Polk Street Press’s website) and let us know what you think. Unfortunately, it seems that deeming it a “drop in replacement” wasn’t 100% accurate; while SMPageControl provided a pixel perfect representation of UIPageControl, it lacked UIAccessibility support all together. I hate to admit it, but until recently I haven’t paid much attention to accessibility in the iOS apps I’ve worked on. That has changed – for a variety of reasons that I plan to cover in a future blog post – and SMPageControl now really is a drop in replacement, providing the exact same UIAccessibility behaviors as UIPageControl. In sticking with the theme of being UIPageControl’s Fancy One-Upping Cousin, SMPageControl extends UIPageControl’s accessibility functions by letting you give each page its own name. The default behavior is to set the accessibility value to "page [current page + 1] of [number of pages]". e.g. "page 1 of 10". If a page has been named, the provided name is prepended to the default accessibility value. e.g "Search - page 1 of 10". This is extremely useful when using per page indicator images, where one or more page is likely to have a specific usage that is identifiable to the user. With the addition of accessibility support, I feel comfortable calling SMPageControl a 1.0; bugs may still surface, and features may be added, but the goal of creating a fully featured page control has been achieved. Having reached this point, I’ve created a 1.0 version tag in the git repo and added it to CocoaPods. As always, feedback is welcome. We accept pull requests for features and bug fixes at the GitHub repo, so if you’d like to contribute, by all means, please do. Recently we at Spaceman Labs have been testing out different tools and workflows to manage our various projects. After trying a few different packages, we’ve more or less settled on Asana as our issue tracking solution. It’s got a lot of advantages: it’s free, we can have as many projects as we want, and it’s low-friction enough that we’re likely to use it regularly. That last one is actually the biggest feature – just as the best camera is the one you have with you, the best issue tracker is the one you’ll actually use. All the bells and whistles in the world don’t matter if you’re scared away from the core functionality. But there’s one way Asana could be even easier to use. It doesn’t have a standard way to integrate with our Git workflow. We’d like to be able to commit some code with a comment like “fixes #123” and have that fix reflected in Asana. Fortunately, all of the groundwork has been done. Asana has a really awesome, and beautifully well-documented, API. And other developers, most notably for our purposes Bruno Costa, have taken that API and put together useful scripts. The only thing missing from Bruno’s post-commit hook (and go back and read his blog post if you haven’t, it’s great) is the ability to run it non-interactively. Our Git workflow is built around Tower; it’s an awesome tool, but it doesn’t know how to simulate reading from /dev/tty in a hook. "Tweaked the widget; fixed #1, #2, and #3; references #4 and #5; oh yeah, and closes #6"
and have the right thing happen. Neat, right? You can find the script at our GitHub page; please modify and open pull requests if you’d like to see it do more. (For instance, re-opening a closed ticket would be trivial.) V1 of the script is duplicated below. To run it, save it to your local repo’s .git/hooks/post-commit, and chmod 755 that mother. Run the git config line at the top of the script with the appropriate values, and you’re good to go. IFS=' ' read -a words <<< "$comment"
There’s a mistake I have, to my own great embarrassment, made twice, so I think it’s worth writing up for posterity. This one’s brief: you can laugh at me and move on. Under ARC, AVAudioPlayers don’t retain themselves while playing. AVAudioPlayer is the simplest API to get an audio file from your Resources directory to your user’s ears. And you’re set! Under manual memory management, anyway. What happens with ARC? The newly created player is retained. As soon as the method ends, however, there is no longer anything referring to it. Even though it’s still doing stuff — the audio file you’re playing will presumably last longer than a millisecond — it’s released, and happily cuts off the audio early. Having reasoned through it, the solution is of course trivial. Make the AVAudioPlayer an instance variable of whatever class is creating it, and it won’t be released until the controlling object is. Audio bliss. // don't do this in production code, obviously! It is a bad way to do basically anything. If you’ve ever spent any time at Dribbble, you know how much designers love to customize UIPageControl, normally in the form of custom spacing or fancy inset looking page dots. As a developer, you’re probably also keenly aware of the lack of customization that Apple’s built in class provides. Hell, it wasn’t even until the introduction of iOS 6 that you could change the tint color, and even then, that’s where the flexibility ends. Given my blogging absence in recent months, and the fact that I have a somewhat immediate need for a highly customizable page control, it seemed like a fun opportunity to spend an afternoon making something I could share. Admittedly, this isn’t a terribly hard problem to solve – UIPageControl is one of the least sophisticated bit of UI in iOS. Despite this being an open-source softball, I was excited by the idea of writing something simple, yet robust enough that I wouldn’t have to tackle this issue ever again. SMPageControl provides all the functionality of UIPageControl, but also adds the ability to change indicator diameters, margins and alignment. It also provides support for using images as the inactive and active page indicator. For greater control, it is also possible to provide index specific indicator images. If you’re not interested in the fanfare and hot air about to follow, go ahead and just grab the code from GitHub. Update: Two new features have been added. A masking mode that will allow indicators to use the tint coloring, along with an image as a clipping mask. And a convenience method for updating the current page by passing in a scrollview. Using this class is as simple as they come, you can quite literally just change your class names from UIPageControl to SMPageControl, and SMPageControl will seamlessly provide all of the bland, out of the box functionality you are used to. It also provides the same two (and more) UIAppearance properties, pageIndicatorTintColor and pageIndicatorTintColor. I’ve made an effort to precisely mirror the default functionality, so that UIPageControl can be used as normal, while being able to make a quick shift to SMPageControl as soon as extra flexibility is required. SMPageControl allows for the tried and true page control appearance, with some slightly adjusted layout. Using the fully UIAppearance compatible properties, indicatorDiameter and indicatorMargin, it’s easy to make SMPageControl appear a bit more modern. Alright, so bigger, more whitespace; that’s hardly Dribbble worthy, right? 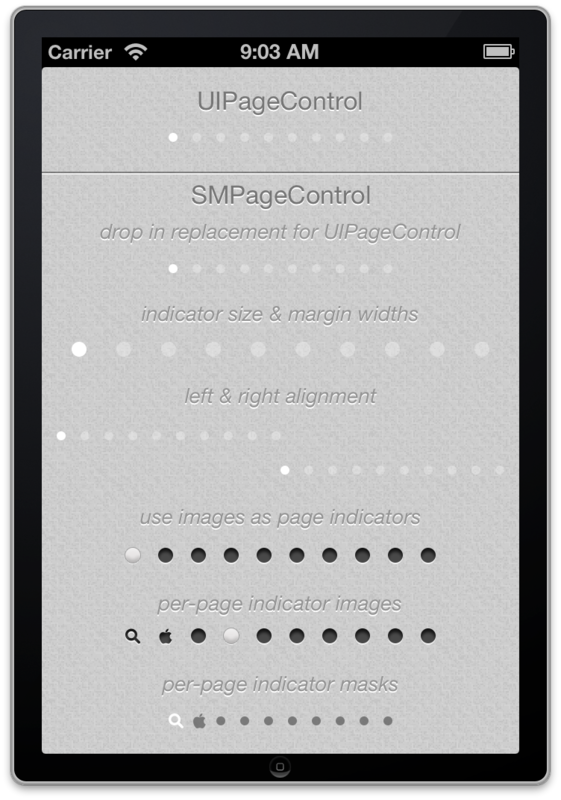 Well fortunately, SMPageControl has two more powerful properties – Also UIAppearance compatible – pageIndicatorImage and currentPageIndicatorImage. These are probably my favorite two properties, as they allow for a wholesale replacement of the active and inactive “dots”, with two quick and easy lines of code. The final bit of customization provided by SMPageControl is its support for per-indicator images, a function that really is the icing of its flexibility. The easiest example of this to point out is the all too familiar Springboard. Ever since Spotlight was added in iPhone OS 3.0, the springboard page control has included a little search icon along with those classic circles. SMPageControl makes this sort of customization trivial. Because of the case by case nature of how I expect this feature to be implemented, per-indicator images are not compatible with UIAppearance – but adding them is just as quick and easy. I suspect that for a problem with such a narrow set of requirements, there isn’t much left that this little project doesn’t cover. That seems to be further supported by the similar feature set of this project and the others I’ve found. (P.S. It’s generally best to do the diligent Googling before writing your own new code to solve solved problems – whoops). However, I already mentioned that I wanted this to be robust enough that I wouldn’t have to chase a similar solution ever again. If there’s something I’ve missed, fill out the comment box just below. If you’ve read this far, I’m impressed – and it’s probably time you just went and grabbed the code for a bit of tinkering. Turns out, nope! Somehow this runs the completion block in parallel with the animation block. The solution? Simply changing the YES to a NO in the scrollRectToVisible call. It seems that Core Animation (and therefore UIView animation) does some unexpected, not entirely welcome magic behind the scenes. If there is nothing to do in the animation block, the framework shrugs and runs the completion block immediately, rather than waiting the specified duration. My guess, and this is just a guess, is that internally Core Animation depends on the animationDidStop:finished: delegate callback from a CAAnimationGroup or similar it sets up to handle everything that happens inside an animation block. When that callback fires, CA knows it’s time to kick off the completion block. If there are no animations created, there is nothing to send a callback. Rather than set a timer to wait for nothing to happen, the completion block runs right away, because why not? This is seductive reasoning, and has the advantage of being easy to code. Unfortunately, it’s not always what the user of the API expects. (I would venture to say never!) In our case, it means the naive code fails because (again, guessing) asking the scroll view to animate its scrolling sets up another animation context. Asking it not to animate, by contrast, allows Core Animation to create an implicit animation and work its magic. Unfortunately, for us API clients there really isn’t one. This is more of an informational post than anything: once you’re aware this can be a problem, you may save yourself hours you otherwise would’ve spent in fruitless debugging. Believe me, I’ve been there on this issue. Try scrolling the text view all the way to the bottom, then compare the difference between animating and not animating inside of an animation block. Then do the same with the progress view. Why would they be different? There are plenty of other classes in UIKit with methods that take an animated: argument. I encourage you to plug them into this test app to see just what happens. Protect yourself from being surprised next time. Take any precaution you can against the embarrassment and social shunning that inevitably accompany premature completion.